Crewlists for the Port of Salem give a look at Ezra's beginning as a seaman. The earliest found was in 1804, when he is described as 18 (he was actually 17), 5' 8" and with dark hair. He sailed on the ship Endeavor, Capt. James Buffinton, out of Philadelphia for Marseilles. The ship and crew were based in Salem, so why the record of the trip starts in Philadelphia isn't apparent. The Salem Register of 12 November reports that the ship had arrived in Philadelphia "in 13 days," but no sailing notice from Salem appears in the newspapers. They were cleared to sail from Philadelphia on 22 November.1 They were reported at Gibraltar presumably already having been to Marseilles, on 22 April 1805, to head for Salem in 10 days.2 The Salem Gazette of 5 July reported that the ship had returned on the first of that month. Ezra's next trip was in the following August on the same ship, but a different master (Jeremiah Page). The crewlist is dated 6 August 1805, and this time he was 20 years old, off by two years. Their destination was Isle de France, now Martinique. They reportedly had just arrived on 26 November.3 The 14 April issue of the Register says that Endeavor was at "Bourbon," 2 January 1806, from Isle de France, and was loading. Given that they were heading for India, this may be a reference to Isle Bourbon, now Reunion Island east of Madagascar. The 9 May issue of the Gazette says that the ship had sailed from Isle de France at the end of January for Calcutta. One of the January references must be wrong. They sailed from India on 2 May and arrived back in Salem on 25 September. 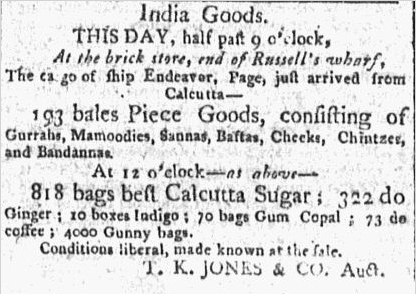 4 The arrival notice mentions that sugar was expensive and hard to come by in Calcutta, as were fabric "piece goods." Why Capt. Buffington knew this becomes apparent in an ad in the Democrat of Boston, shown below, providing a nice snapshot of the goods they were shipping. A less extensive trip came next aboard the brig Industry. It was cleared by 9 December 1806 for "Leghorn," which is the English name for the Italian city of Livorno.5 Jonathan Cook was captain. About mid March 1807 they were in Barcelona after a 105-day leg from Salem.6 They were still there on 5 May, and were reported "riding quarantine" in that month.7 Industry arrived back in Salem on 28 July, 65 days from Barcelona.8 A later notice says they sailed from Salou, Spain.9 No mention of having been in Leghorn was found. Ezra downsized again when he sailed on the schooner Two Brothers, Capt. Nathaniel Fowler.10 The crewlist is dated 13 October 1807, and they were cleared to sail and may have already left by the 15th for the West Indies.11 They were back in Salem from Trinidad after 30 days sailing on 23 January 1808.12 The ship's log, excerpted in the paper, says that on 30 December, 3 days sailing distance from St. Croix, they were boarded by the British sloop-of-war Melville and told that St. Croix and St. Thomas had surrendered to England within the previous 10 days. Ezra appears on a list of soldiers in the War of 1812. He served between 21 June and 22 August 1814 in Capt. Lamson's company of Lieut. Col. Levi Dodge's (Third) regiment.16 Their activity in the war has not yet been found. Ezra as ship master is so far a mystery. He hasn't yet been postively connected with any ships as a captain. He was co-owner, with many others, of the bark San Francisco out of Beverly, made in Cumberland, Maine, in 1839 and registered on 6 August 1839. It was advertised to sail with a party to California in the same year. It is safe to assume that this group of investors wanted a piece of the Gold Rush. Ezra co-owned the brig Poconocket out of Beverly, which was made in Brewer, Maine, in 1847 and registered on 30 September 1853. His partner and master of the boat was his brother-in-law Joseph Thissell Haskell.17 The boat was registered again on 13 August 1856 under the ownership of Ezra and his sister-in-law Augusta Obear, and lost at sea. A tiny notebook found in the collection of Virginia Carpenter records payments made by Ezra in connection with two schooners, Bunker Hill and German. Of German nothing further has been found, but Bunker Hill was made in Northport, Maine, with dimensions of about 79 feet length, 23 feet width and 127 tons.18 It was registered at Salem in March 1832 and at Beverly in June of that year under the ownership of Ezra and Henry Larcom, a cousin by marriage. Beginning in 1829 and for several years, Beverly tax records give brief descriptions of the real and personal estates of the heads of households in town.19 Here we learn that Ezra was part owner of (John) Safford's Wharf. Personal estates in the tax records were limited to items of highest value. Ezra had vessels, stocks and cash on his list. He was probably living with his father up to this time, who, according to his Revolutionary War pension file, was living very modestly with an infirm wife and his sister Lois in 1818. 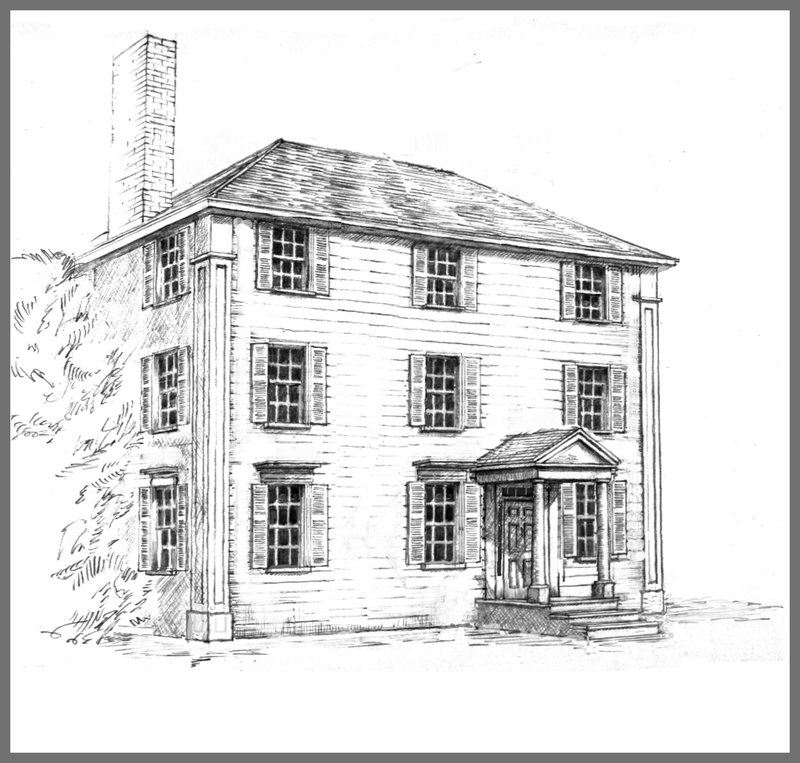 This source also says that Ezra bought their house at an inflated price in 1821 in order to defray John's debt to him for supporting the trio. This doesn't correspond to the tax records. The 1825 and 1828 taxes list John with the real estate. Ezra, aside from a comfortable personal estate that jumped $3,000 in those 3 years, only had ownership or part interest in Safford's Wharf. The latter was also known as Ellingwood's wharf and was directly across the street from the Ellingwood houses by the ferry. The 1829 taxes finally say that Ezra owned a house and land and John was part owner. Ezra's personal property of the greatest value (to which the taxes were apparently limited) were "stock in trade, vessel & money" totalling $6,500 in value. His personal estate had been $6,000 the previous year. What filled his coffers between 1825 and 1828 hasn't been discovered. In 1830 and 1831, John was back to being the only real estate owner. In 1830 Ezra was taxed for part of a wharf. A gain in personal property by 1831 was relatively modest. At 46, Ezra married Elizabeth Haskell in 1834. She was 24. Perhaps due to his new familial relationship, Ezra was appointed guardian of Elizabeth's under-age siblings (who, including Elizabeth, were orphaned in 1829), probably to oversee the sale of some of their father's land in 1835. 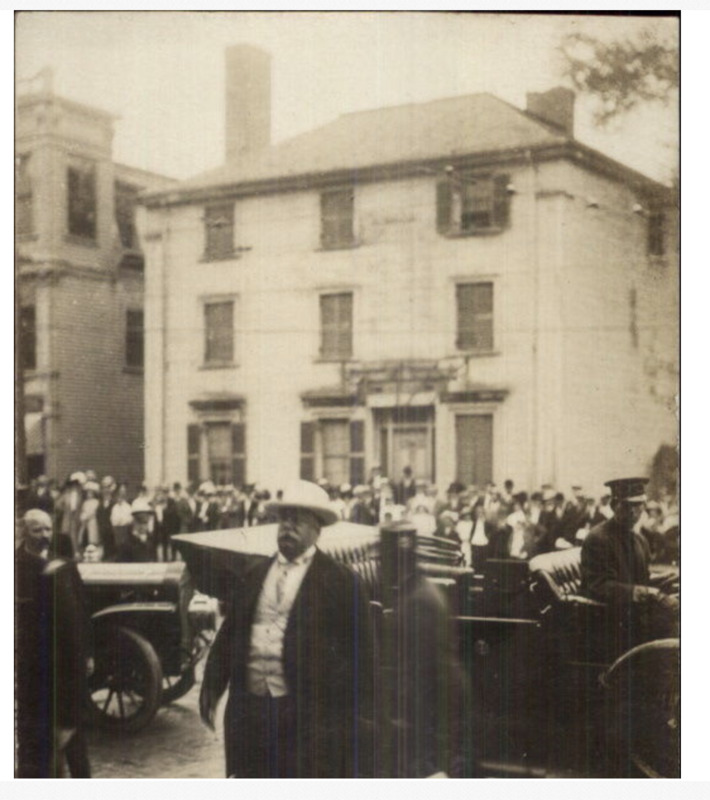 Ezra and his growing family moved to a house on the southwest corner of Cabot and Federal Streets. This house is said to have been built for Benjamin Ellinwood in 1784. The City of Beverly decided to widen Cabot Street in 1900, and took the front yard and even the steps and entry portico off the house, but Ezra's daughters, now living in the house by themselves, had no intention of moving. After years in that state, it was only after Melanie died in 1924 that Ella moved out and the house was, according to the family, torn down, although it was reported elsewhere as drastically remodelled. The "Ellingwood Building" was commissioned by Charles Hoyt Ellingwood, and Woolworth was the first retail tenant. That building still stands. 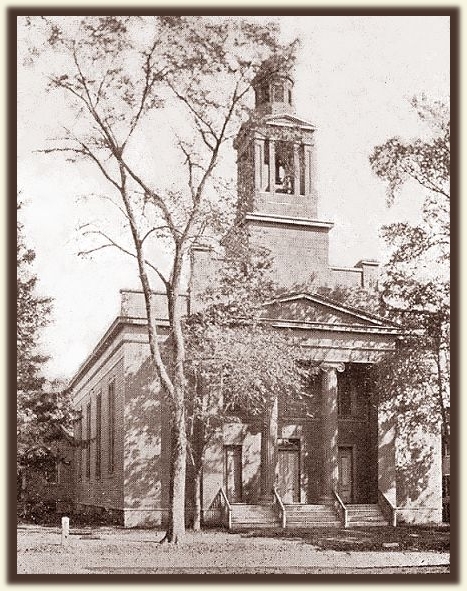 Ezra was voted one of Beverly's selectmen for the years 1832 through 1835.20 In 1832 the selectmen were part of a Board of Health which was to "act and do anything they may think proper towards securing the town against that deadful scourge, the Cholera, which is desolating so many places." For two years he was a candidate to represent the town in the county legislature. Know all men by these presents, that I Ezra Ellingwood of Beverly in the County of Essex and state of Massachusetts, gentlemen, being of sound and disposing mind and memory to make and publish this my last will and testament. First, my will is that my just debts and funeral charges shall by my executor hereinafter named be paid out of my estate as soon after my decease as shall by him be found convenient. Second, I give and bequeath to my wife Mary Ann Ellingwood my house furniture. She is also to receive one-third part of my personal property and the improvement of one-third part of my real estate, or the income of the same during her natural life agreeable to her right of dower. Third, I give and bequeath to Eveline Amelia Ellingwood one-third part of the homestead so-called consisting of the dwelling house and land under and adjoining the same. Fourth, I give and bequeath to my son Edward Payson Ellingwood one-sixth part of my dwelling house with the land under and adjoining the same and all my wearing apparel and silver watch. Fifth, I give and bequeath to my son Lyman Ellingwood one-sixth part of my dwelling house with the land under and adjoining the same. Sixth, I give and bequeath to my two daughters Melanie Augusta Ellingwood and Ella Torrey Ellingwood one thousand dollars each to be paid from my personal property to be held in trust and in addition one hundred dollars each to be put in the Savings Bank to be at their disposal. Seventh, I give to Melanie Augusta Ellingwood one-third part of my interest in the Parsonage house so-called and one-half of my Spanish claim, interest paid annually at Beverly National Bank, also my gold watch. Eight, I give to Ella Torrey Ellingwood one-third part of my interest in the Parsonage house and one-half of my Spanish claim. Ninth, I give to my son Charles H. Ellingwood two hundred dollars. Tenth, I give to my executor hereafter named two hundred dollars for his trouble and expense he may be subjected to in the performance of his duty in executing this my will. Eleventh, I hereby name and appoint Charles H. Ellingwood executor to this my last will and testament. Twelfth, I hereby name and appoint Charles H. Ellingwood trustee from my two daughters Melanie A. Ellingwood and Ella T. Ellingwood. They are to receive the interest that becomes due every six months on their money held in trust and in case of sickness such part of the principle as may be needed. Thirteenth, I give the remainder of property whatever it may be to Edward P. Ellingwood, Charles H. Ellingwood, Lyman Ellingwood, Melanie A. Ellingwood and Ella T. Ellingwood each to receive an equal part. In testimony whereof I have hereunto set my hand and seal and publish and declare this to be my last will and testament in the presence of the witnesses named below this 30th day of March in the year of our Lord eighteen hundred and sixty-seven. Ezra died of old age and is buried next to his daughters, his wives and their parents in Central Cemetery, Beverly. The family doctor was Augustus Torrey, who married Ezra's second cousin Sarah Cox. 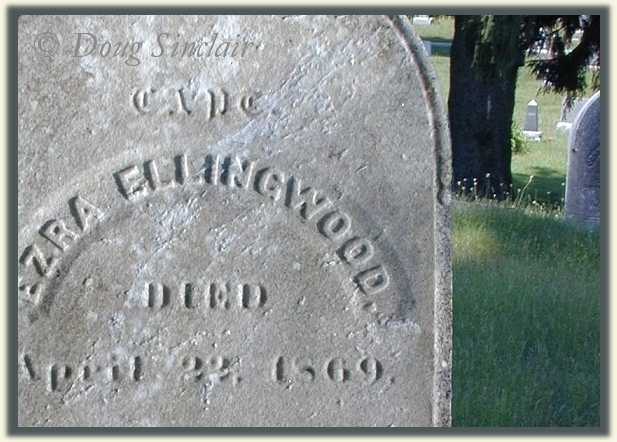 Ezra and Elizabeth's daughter Ella Torrey Ellingwood was named for him. His son Edward, who went to school at Thetford Academy far away from Beverly in Vermont, may have become a seaman. He appears in English court records as having been convicted, with several others, of breaking and entering premises in Oxford in 1854. They were sentenced to 4 months in prison. He likely returned to the US in 1865. After his father died, he sold his share in his estate to his sister Melanie. Nothing else has been found about him. 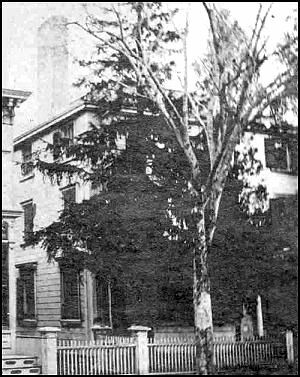 In Beverly, legend has it that there was animosity between the Ellingwood sisters, and they lived in different parts of the house. They didnt change anything, thinking that Edward would one day come back to them from them from the Civil War and it would be as it was. There certainly is some mythology in this. Their mother, who isn't accounted for in these stories, was alive into the 1890s. 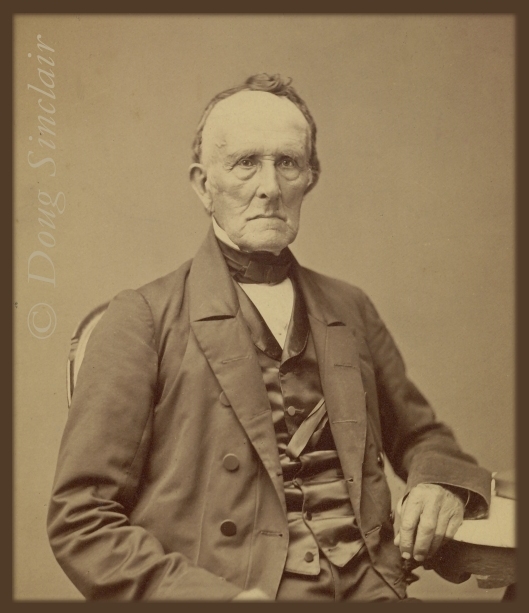 It was brother Charles who was in the Civil War, and he and his family stayed in touch with the family still in Beverly, his heirs eventually inheriting that property. Brother Lyman's will states in writing that he had no relationship with his sisters and brother Edward. He gave them each a dollar, not having heard from them in decades and that they sided against him on some issue. He left his house to his maid and the rest to brother Charles' heirs. sources for vital records: Ezra's birth, death and marriages can be found in the Beverly, MA, vital records. His death is also among the Mass. Dept. of Health vital records (1869: vol. 22, p. 166). His first marriage is noticed in the Salem Gazette (20 May 1834, p. 3), shown above, and the Columbian Centinel (21 May 1834), "Capt. Ezra" and "Elizabeth E., daughter of late Samuel Haskell" in Beverly. His second marriage has been found in Massachusetts State Health Dept. records (1845/1846: vol. 18, p. 79), where it says that they were married by Rev. George T. Dole of the Washington Congregational Society, Ezra a widower and merchant, age 57y, 10m (should be 12, this may be a transcription error), 24d. His death is also recorded in the Health Dept. records (vol. 220, p. 166), age 82y, 4 m, 13d, of old age, married, mariner, b., res. and d. in Beverly, son of John, b. Beverly, and Hannah, b. Marblehead. The date is also on his gravestone, Central Cemetery, Beverly. 2. New York Gazette, 10 June 1805, p. 3. 3. Ibid, 27 February 1806, p. 2. 4. Ibid, 26 September 1806, p. 3. 5. Ibid, 9 December 1806, p. 3. 6. Ibid, 19 May 1807, p. 3. 7. Salem Register, 13 July 1807, p. 3; Reperatory, 17 July 1807, p. 3. 8. Salem Gazette, 19 May 1807, p. 3. 9. Essex Register, 3 August 1807, p. 3. 10. Two Brothers, 74 tons, was built in Danvers in 1797. When it was registered on 9 Oct. 1807, Nathaniel Fowler of Beverly was listed as owner and master. 11. Baltimore Price Current, 22 October 1807, p. 4. 12. Salem Gazette 26 Jan 1808, p. 3. 13. Salem Gazette 26 April 1809, p. 3. 14. Salem Gazette 21 July 1809, p. 3. 15. Essex Register 12 August 1809, p. 3. 17. 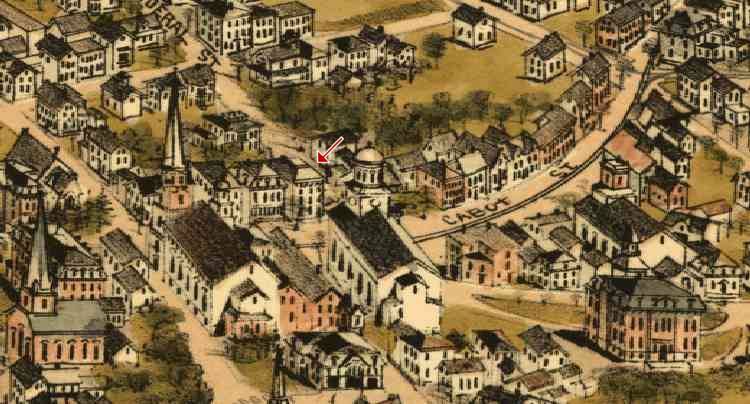 ?Essex County Historical Society Quarterly, "Ship Registers of the District of Salem and Beverly, Mass. 1789-1900" (this needs to be checked. Is this published in the ECHSQ series or by itself? If the latter: (Salem:1906). 23. Salem Gazette, 9 October 1835. 24. Essex County Surrogates Court, wills, vol. 426, pg. 153. 25. Ezra's children's births are recorded in the Beverly vital records.